What governs your choice of what to read next? The last two novels I opted for weren’t on my TBR pile (still teetering); I was inspired by two other bloggers – Susan Osborne at A Life in Books for the subject of my previous post, Sarah Moss, Bodies of Light, and Ali at the Heavenali blog for today’s, the (now rather neglected) 1974 co-winner of the Booker Prize that year: Stanley Middleton, Holiday. As she and others have summarised the plot and Middleton’s life admirably (1919-2009; wrote 44 novels – links at the end), I’ll commend to you her review for details on such matters. Here I’d like to examine a few key literary features in some extracts that demonstrate his scrupulous style and technique . It’s the meticulous consideration of acutely observed details in the quiet lives of ordinary people that Middleton excels at; nothing wrong with writing about unexceptional provincial, middling people – George Eliot showed this in Middlemarch, while the blurb on one edition of the novel describes him as ‘the Chekhov of suburbia’ (a phrase also used of John Cheever). His debt to D.H. Lawrence is apparent, and he shares much of his fellow Nottinghamshire artist’s ability to relate ostensibly mundane subject matter in beautifully crafted literary prose. The novel consists mostly of flashbacks in which, through the focusing filter of protagonist Edwin’s cultured mind (he’s a thirty-two-year-old university lecturer in the philosophy of education), we are given access to his every intimate thought – especially how he came to find his wife Meg’s tempestuous nature increasingly unbearable, especially when her moody outbursts became more hurtful after a family tragedy devastated them both. 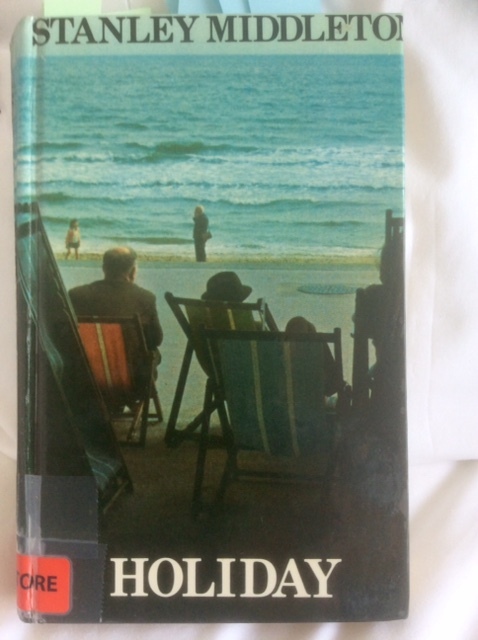 Much of the narrative consists of accounts of the people, sights and sounds Fisher encounters as he wanders aimlessly around a shabby Lincolnshire seaside resort, processing these experiences as a starting point for his forensic dissection of his painful relationships, first with his unimaginative, undemonstrative parents, and then with his wife. Edwin hated his parents then, for the shopkeepers they were. Obsequious, joking, uneducated, the finger-ends greasy from copper in the till, they drew attention to themselves. When the retainer ushered his rabble round the stately home, Father Fisher asked the first fool question, chirped the witless crack, was rebuffed in all eyes but his own…Yet the old idiot had brains; he made his shops pay; he’d left his children tidy sums. And he’d read, though with a mind bent, young Edwin had decided, on trivialising. So much is packed into those few lines. The time-frames are suggestively telescoped, in a manner best exemplified by Dickens’ treatment of Pip’s adult recollections of his selfish younger self in Great Expectations. This is seen in the unobtrusive but crucial temporal adverbial ‘then’; does this signify that the narrating, adult Edwin no longer hates his parents? Is he recalling that hypersensitive boy’s bittersweet love/hatred with the more enlightened, forgiving insight of the adult? It’s a raw, painfully honest portrayal of father-son relations that resonates with me – also a grammar-school boy with working-class parents who’d left school at 12, who embarrassed their children as they grew up in a world their generation and class couldn’t fathom. Outside it was bright still, and calmer. On the dressing table he’d put his writing case, which lay open. Perhaps, not this day, he’d write to his wife, a mild letter of description, with no mention of himself, no recriminating, merely a message so that she knew where he was, and in her anger at him could learn what this house, this street, this seaside was like. He’d not apologize or sulk or shout, but put down physical facts about rooms and holiday artisans and lilos until she screamed. Here Middleton’s technique shows in all its acerbically witty ambiguity. The narrator reveals his own deficiencies by highlighting his self-image as a mild-mannered, put-upon victim of a vengefully spiteful, shrewish, selfish wife, while unwittingly conveying the simultaneous impression to the reader that he’s far from blameless in this imploding marriage. He’s calculating and provocative, knowing exactly how to drive his volatile Meg to distraction. He’s also apparently unaware of his insouciant snobbery as he describes the hapless fellow holidaymakers with whom he spends the rest of the novel drinking, ‘chaffing’ and flirting (and while often patronising them – here with ‘artisans and lilos’). He frequently replicates many of the aspects of his father’s character that he hypocritically recalls finding so crass and limited. No such simplicities existed in real life. When these girls married, and they were the sort to become excellent housewives, their husbands would be plagued with their moods, and fears, and boredom, because this was universal; nobody was exempt. But at present he felt no qualms. See what I mean about the patronising tone. Here again is the ironically indirect self-revelation of Edwin: he’s content to generalise about these two harmlessly simple, friendly girls in a manner that shows them to be limited, predictable, while he’s plainly, unknown to himself, projecting on to them his and Meg’s roles (note the telling metaphor ‘plagued’ and the tripled list of nouns signifying his idea of a wife’s typical shortcomings) in his own closely examined but fitfully understood married life. The penultimate sentence there is cold and unbecoming, culminating in its pseudo-existential, intellectually sterile aphorism. The callousness of the last sentence is breathtaking: intelligent and cruelly humorous on several levels. Fisher drove off, disconsolate, down in the mouth…He was in no mind to fault the young man, who spoke out of his own depression, perhaps, talked thus sullenly against a society that promised, proffered him nothing…Everybody judges from the point of view of his own inadequacy. At the very moment of seeming to gain an epiphanic insight, Edwin simultaneously shows once again that he reads the world and its people in terms only of his own partially understood experience. He feels that society (Meg?) proffers him nothing; he too is depressed, and he surely does fault the young man for his cynicism in his family relationships, while failing to perceive his own. – there’s that characteristic use again of ‘perhaps’, suggesting an unconvincing attempt to seem tentatively fair in his mental assessments. They’d paid their dues, and the staff prepared to forget them. New faces that afternoon when the rush of bundling sheets had been scrambled through. Last corn-flakes, bacon, for the zombies, final jokes as if the holiday were still on, still provided pleasure. Fisher felt a stiffness as he braced himself against parting. It seemed entirely bodily, a matter of nerves, not reasoned, not even imagined. Even as Fisher fleetingly seems to empathise with the staff, the free indirect discourse unerringly shows up his ambivalent, ultimately dyspeptic view of them. He’s both sharing their unkind view of his anti-intellectual fellow guests (‘zombies’) while also including the same staff in that generalisation. His genuine sense of Prufrockian stiffness and regret, so often presented in the narrative with apparent self-deprecating uncertainty, also indicates a conflicting desire to appear superior, more sensitive than others, more knowing. I find that sequence at the quotation’s end — ‘bodily’, ‘nerves’, and the pair of negatives — a brilliantly realised and nuanced demonstration of Edwin’s complex, not entirely endearing intelligence, ruthlessly skewered by Middleton’s clinically exact but never judgemental narrative technique. I must read more of him. Thanks, Ali, for the recommendation. Nicholas Lezard’s 2014 Guardian review here of the newly reissued paperback (with handsome covers) by Windmill Books: interesting parallels drawn with TS Eliot, the Fisher King, etc. Sam Jordison’s Guardian 2008 review in his series on past Booker winners here. 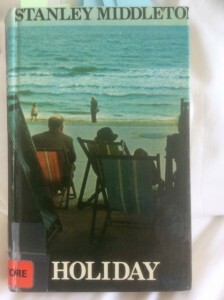 This entry was posted in English Literature and tagged Booker Prize, Holiday, Stanley Middleton by Simon Lavery. Bookmark the permalink. Great analysis, Simon. This novel has been on my radar for a little while ever since I read a review in The Guardian last year. For some reason, I’m reminded of writers like Penelope Fitzgerald and Elizabeth Taylor – I think it’s the acute observation of situations and relationships. There might be similarities in prose style, too? Thanks, Jacqui. I think the review you mention is the one I link to at the end: Nicholas Lezard’s piece about the new Windmill paperbacks. I’ve not read PF for a long time, and v little ET, but I agree – they all share that understated, deeply felt attentiveness to the details in people’s lives. Ali, whose post inspired me to read Holiday, likens Middleton to Anita Brookner, which is probably also an apt comparison. Haven’t looked so closely at the prose style of these others, however: a project for the future, perhaps! Nice review. I’d seen Sam Jordison’s review back when so this was on my radar, but good to have the excellent confirm. Funny how such a good writer can be so utterly forgotten. Thanks, Max. I thoroughly enjoyed this novel, despite its unpromising-sounding plot. An interesting cross-art form companion to this novel might be the 2012 (?) film “Young Adult.” in which a truly off-putting but hilarious “YA” genre writer/former prom queen (who has seen better days) heads home to suburban Minnesota to “reclaim” her high school boyfriend. She is apparently blithely undeterred by the fact that he is now happily married with a young son and has probably not thought of her in years. The same lack of self-awareness, brilliantly conveyed by the script, as well as the sad suggestion of great pain underneath (an earlier miscarriage). Want to read this, it sounds wonderfully subtle. Would also be fun to try to analyze the techniques used by the writer to achieve his results. Your travel entry was so much fun, loved the white parrot!